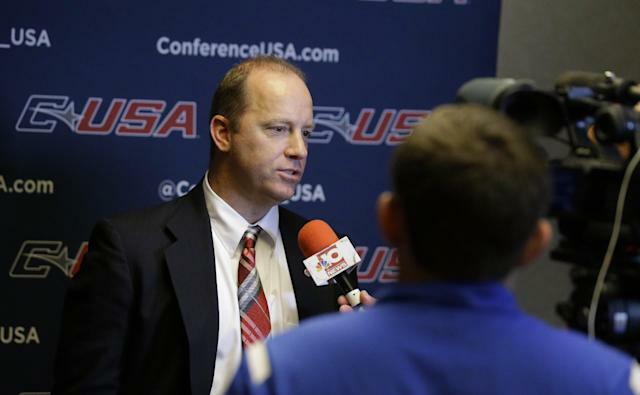 Jeff Brohm’s head coaching debut was a gem. Nearly seven months after being promoted from offensive coordinator when Bobby Petrino left Western Kentucky in January, Brohm’s Hilltoppers racked up a school record 702 yards of total offense in a 59-31 rout of Bowling Green, the defending MAC Champions. Led by senior quarterback Brandon Doughty, the Hilltoppers came out quickly and put the Falcons’ defense on its heels. By the 8:36 mark of the second quarter, WKU was up 21-0 and at half-time it was 31-10. In game one under new coach Dino Babers, the closest the Falcons would get in the second half was 14 points, but Doughty and company continued to pour it on as he threw for 569 yards, another school record, and six touchdowns while connecting with nine different receivers. Taywan Taylor led the receiving corp with 12 catches for 185 yards and a score. The 59 points scored by Western Kentucky, in its first season as a member of Conference USA and sixth overall FBS season, is also a new school record. FINAL: #WKU 59, BGSU 31. Tops break five school records in process – total yards (702), most points scored in FBS. Doughty added three records of his own: Single-game passing yards (569), TD's (6) and completions (46). The decision to hire Brohm was a quick one by WKU. A day after Petrino was introduced (again) at Louisville, the school made Brohm’s hire official. Brohm was WKU’s assistant head coach and offensive coordinator under Petrino in 2013 – a year where the Hilltoppers’ offense saw a gradual improvement as the year went on. A road matchup with Illinois is next on the schedule for WKU and the Illini should definitely be on upset alert. For more Western Kentucky news, InsideHilltopperSports.com.